If you want to know the real effect of a salary increase, you may want to get to know Dan Price. Back in April 2015, Dan Price, the owner and CEO of Gravity Payments, made a revolutionary announcement. He decided to give himself pay cut from $1.1 million to $70,000 a year. The end result? Because he wanted to fund a paycheck raise for his employees. In a move that shocked everyone, Mr. Price raised the minimum wage of his workers to $70,000. Many people praised him for this move. But a lot of people criticized him as well. Several watched with anticipation to see how he will fail – because some of them were pretty sure that he will. This wage increase actually started in 2012. After hearing an angry outburst from an employee, he decided to give his employees a 20% raise. Surprisingly, profits rose even after that momentous raise. Even Mr. Price was surprised. He thought that he will only do the 20% raise once, but that was not the case. Because the profit was great, he was able to give them another 20% raise. You know why profits were rising? Productivity jumped by 30% to 40%. Well fast forward to the present and INC.com published the real score for this company. Apparently, things are still going very well. Since the raise, Gravity Payments attracted a lot of customers and retained great talent in the company to service all the new clients. From 30 customer inquiries a month, they jumped to 2,000. They had to hire more people to help with all the incoming clients. The profits in 2014 alone were estimated at $2.2 million. The announcement in April definitely gave the company’s popularity a push and that contributed to the company’s success. However, you have to understand that the employee productivity and loyalty are the main reason for the rise in profits. Employees are happy and they are showing it in their actions. But despite all of that, we have no idea about the personal effect of a salary increase in the life of every employee. What were their lives like when their income was not enough to sustain their monthly needs? And what happened after they all got the big fat raises? The salary increase that happened in Gravity Payments is actually something that is happening to several of minimum wage employees. According to an article published on NPR.org, McDonald’s, Wal-Mart, Target, and TJX have started increasing the minimum salaries of their employees. This will affect a lot of workers in the country. For Wal-Mart alone, that is a paycheck raise for half a million American workers. Let us try to analyze the effect of a salary increase in the lives of all these people. Is it really a positive boost in the financial life of everyone involved? Or is there a negative effect as well? Obviously, there are three positive effects of this salary hike. You will have more money coming in. The first effect is an increase in the monthly cash flow. You will have more money coming in because you are entitled to a higher salary. That means more funds for you. This is the most obvious and simple among all the effects of a salary increase. It is also the effect that will lead to more benefits. You are able to contribute more towards financial obligations. We all have financial obligations – most of which are directed towards our debt. After all, is it possible to live a debt free life with $30,000 a year? It probably is, but you have to admit it will be very difficult to do so. A paycheck raise will help you pay for all these financial obligations. You can pay more towards your debts and other monthly bills. You can afford to spend more. Finally, a higher salary will allow you to spend more each month. You can buy more food and groceries. You can also afford to increase your entertainment expenses. You can even afford to go on more trips and vacations because you have more extra money. These three are the positive effects of a wage hike. But beyond these three, you have to understand that there are also negative effects. You may not realize it, but there is a disadvantage to earning more. If you are not careful, these may lead to the destruction of your financial life. You will get used to a more expensive lifestyle. One of the downfalls of getting a paycheck raise is getting used to a more expensive lifestyle. This is actually a bad habit of employees. Most of the time, the first thing that they do when they get a raise is to upgrade their lifestyle. This can be dangerous especially when a financial crisis happens. You might find it hard to adjust and make sacrifices in case your money runs out on you. You get too comfortable to monitor how you spend your money. Another negative effect of a salary increase is being too complacent. This may be a positive trait but too much of it, especially when it comes to money, can be a bad thing. For instance, you may be too comfortable about the money coming in that you stop monitoring where it goes. This can be dangerous because you might be spending too much already or racking up too much debt. If you fail to monitor it, you might be in a big financial trouble and you are still unaware of it. When asked about the federal minimum wage increase, PayScale.com reveal the thoughts of the high-income earners. According to the survey, there are more people against an increase in the minimum wage. It is not a big difference – 50.6% are against while 49.4% agree to the raise in the minimum wage. Most of these respondents are probably thinking about the financial implications that this salary increase will bring. We all deserve a paycheck raise, but we do not deserve to be threatened by the negative effects that it can have in our financial lives. 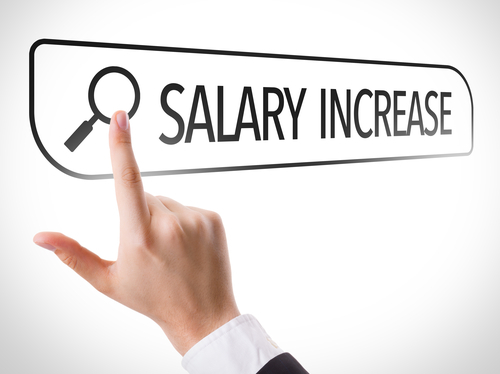 The truth is, the effect of a salary increase is only bad depending on how we react to it. If we start being careless because we feel financially invincible, that could compromise our financial standing. To make a wage hike purely beneficial, here are the steps that you need to take as soon as you find out that you will get a paycheck raise. Pat yourself on the back. After all, you deserve this raise and you worked hard for it. Congratulate yourself but only with a pat on the back. That is all that you can afford for now. Wait until you get that first paycheck. This is very important. Although you know that you will have a pay increase, it is vital that you wait for the actual paycheck first. You have to see how much is your take home pay after the taxes and other deductions are removed. Remember that as your income increases, so will your income tax bracket. Any changes that you will implement should be based on your new net income, not your gross. Reassess your current finances. While waiting for the first paycheck to come in, you need to look at your finances. See if there are areas in your life that require additional payments. Analyzing your financial position will help you identify the next steps that will help you improve it. Boost your emergency fund. Once you know your finances, you have to look at your emergency fund. See if you can add more money into it. Take note that even if you have a reserve fund before, that may be based on your expenses when you had less money coming in. An effect of a salary increase is adding more financial obligations in our budget. Make sure your emergency fund can cover these adjustments. Pay off what you owe. When your emergency fund is okay, you have to start paying off any debt that you owe. If you have credit cards, it is important to make bigger contributions so you can wipe out any balance that is being carried over to the next month. An increase in wages can help you stay out of debt but make sure you commit to your payments. Identify saving goals that need more contribution. If you have a college plan for your kids, your retirement plan, a down payment for a house, or even that annual vacation – these saving goals may need additional contributions. Check if you can allocate more so you can reach your goals faster. Celebrate your salary increase. Finally, when everything is done, that is the only time that you should celebrate. Have a party, buy yourself something nice or go out on a date. You deserve the prize but make sure you consider the other steps that you just went through as you decide on the best way to celebrate your salary increase.